Did you know that spinach has so many benefits if you include it in your diet? It is good for your skin , bones and hair. It has protein, iron and many important vitamins and minerals. It is even said to lower the risk of cancer and development of asthma and lowers your blood pressure. Now after reading that who wouldn’t want to eat some spinach for dinner tonight? 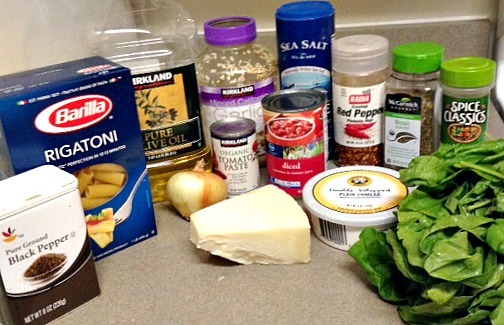 I found a delicious dinner that my family tried out last night and it is for a creamy spinach pasta. So it was full of yummy green leaves that helped my family’s skin and bones become healthier. 1. Make the pasta According to the package directions. While pasta is being made make the sauce. 2. Heat the olive oil in a large skillet. Add the onion and garlic and cook until translucent, about 5-8 minutes. 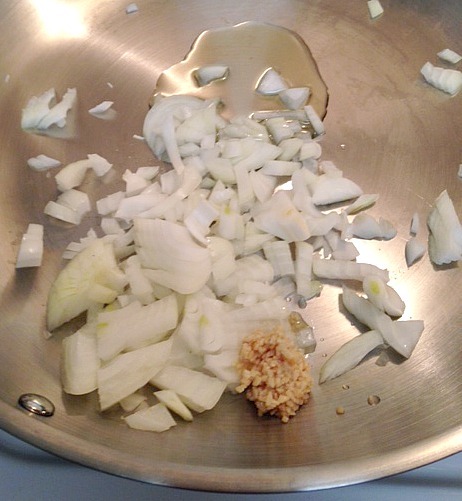 If you want to make sure not to have crunchy onions make sure to cook long enough. I didn’t and ended up crunching into an onion every time I took a bite of the pasta. If that is something you like then cook for less time. 3. 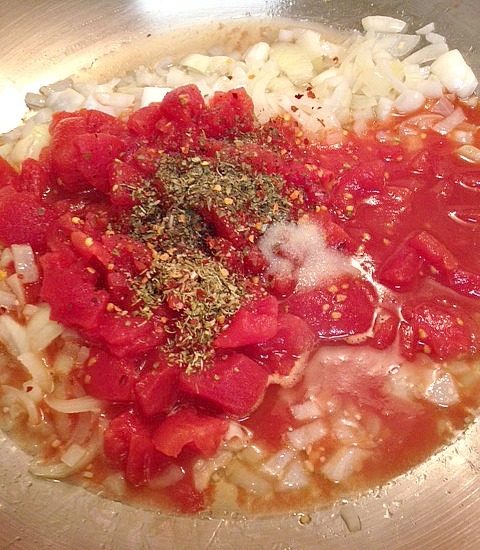 Add the can of diced tomatoes, oregano, basil, salt, pepper and red pepper flakes. Stir to combine. 4. Add the tomato paste and 1/2 C of water and stir until combined. 5. 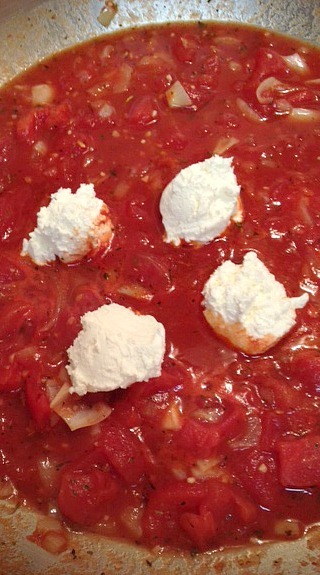 Add cream cheese and whisk until the sauce is creamy. 6. Add the parmesan, 1/2 at a time, stir in each time until melted into the sauce. 7. Add the spinach and stir in until the spinach is soft, about 3-5 minutes, and then add the pasta. Stir to coat and serve. Make the pasta According to the package directions. While pasta is being made make the sauce. 2. Heat the olive oil in a large skillet. Add the onion and garlic and cook until translucent, about 5-8 minutes. 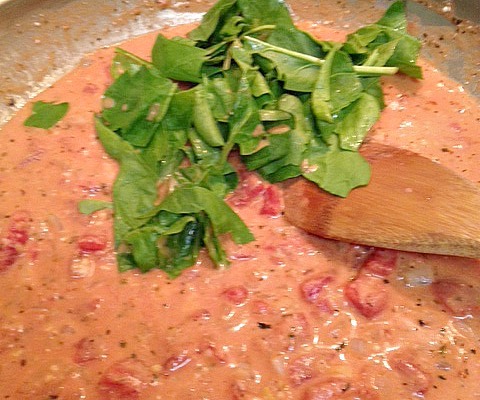 Add the can of diced tomatoes, oregano, basil, salt, pepper and red pepper flakes. Stir. Add the tomato paste and 1/2 C of water and stir until combined. Add cream cheese and whisk until the sauce is creamy. 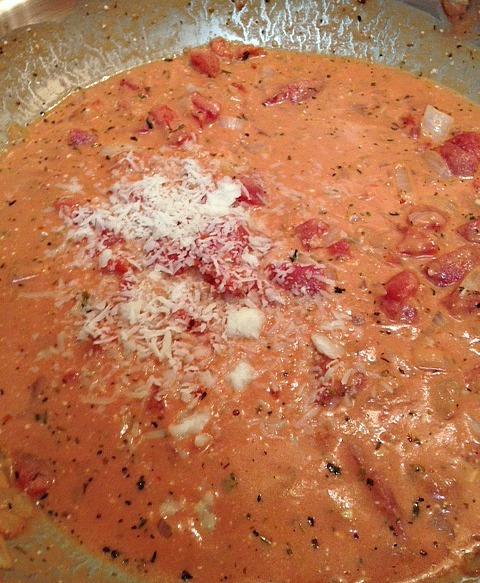 Add the parmesan, 1/2 at a time, stir in each time until melted into the sauce. Add the spinach and stir in until the spinach is soft, about 3-5 minutes, and then add the pasta. Stir to coat and serve. 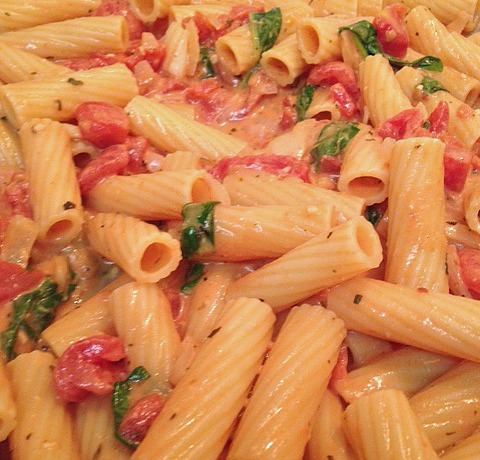 This pasta was very good, the whole family loved it! There was a little kick from the red pepper flakes and the sauce was so creamy. This will be made again for sure! This looks like such a great dish! I love pasta and always appreciate recipes that include something really healthy like spinach.